Learn how to set up Record Validation for validating phone numbers. If you're interested in how to use phone number validation, read our Usage Guide. The standard configuration of Record Validation maps the Phone fields of the Lead, Contact and Account Object to the designated Country fields. We use the Country field value to determine which validation to apply. You can set a default value for the Country field in the Record Validation Setup, or define a Country value while entering a record. If you want to add an additional phone field to be used with Record Validation, you can click 'Add Validation'. Phone Pick a phone field you want to use with Record Validation. Country Map the Country field. The value of the Country field determines the validation format. Format Decide in what phone format you want to standardize your phone value. 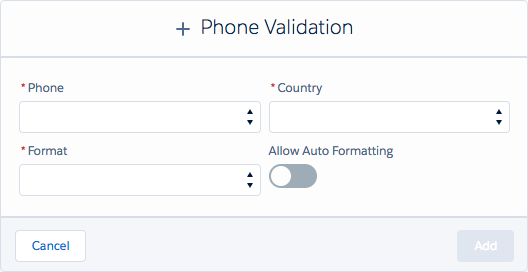 Allow Auto Formatting Allow Record Validation to automatically format and validate your phone number values. How does Record Validation validate your Phone Number? Record Validation analyses your (international) phone number value and parses, validates and formats based on your predefined Country value. Format your phone number on-the-fly when a user enters each digit, or validate after the value is entered. It returns a value that is a confirmed valid, formatted phone number.